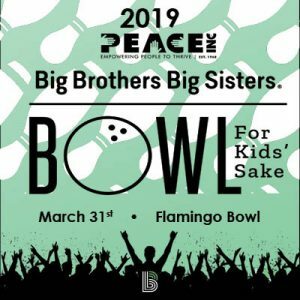 Bowl for Kids’ Sake | PEACE, Inc.
Make a donation to the event. Adult bowlers must raise a minimum of $50 in pledges. Bowlers 18 and under must raise a minimum of $10. Start times are 11:00 & 1:15. Be sure to reserve your time slot as soon as possible. Registration deadline is at Noon on Friday, March 29th. You should arrive at Flamingo Bowl 20 minutes prior to your scheduled time for check-in. 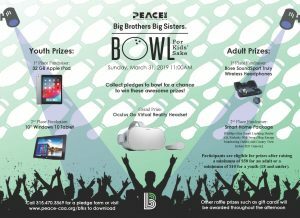 Your minimum pledge gets you bowling, shoes, refreshments, eligibility into the door prize drawings that are happening all day long, and photo booth. Visit with SU’s Otto from Noon until 1:30pm. We are working on some additional surprises. Create a online fundraising page for your pledges and/or download this 2019 BFKS pledge page for in person pledges. 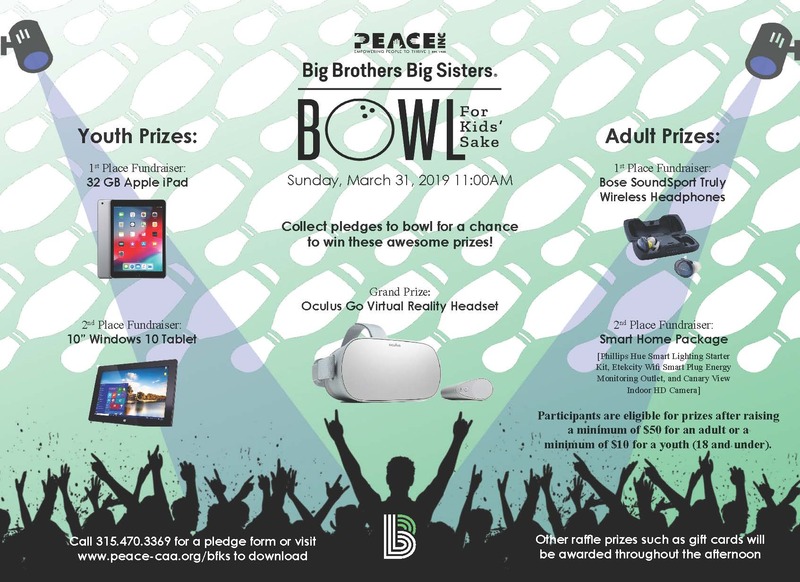 Bowl for Kids’ Sake is about having fun and helping kids continue on a positive path. It is Big Brothers Big Sisters’ largest annual fundraiser which raises money for children in need. By supporting Bowl for Kids’ Sake, you can Start Something in your community–more Bigs and Littles can be matched, more friendships can be gained, and improved outlooks on life can be started.